It’s less than a week until the Advances in Genome Biology & Technology meeting (#AGBT2013) in Marco Island, Florida. Historically, this meeting has been like a debutante ball for the sequencing community — the place where new technologies are showcased, promised, and occasionally delivered upon. AGBT 2010 highlighted new emerging sequencing technologies like Pacific Biosciences and IonTorrent. AGBT 2011 was all about smaller, more affortable benchtop sequencers like the MiSeq and PGRN, culminating with a huge guy literally carrying in a prototype IonTorrent PGM. AGBT 2012 focused on sequencing’s clinical applications and saw the stunning announcement of Oxford Nanopore’s jump drive sequencers. Sequencing, of personal genomes and cancer genomes, is the weather-tested mainstay of agenda topics from recent years. There’s a substantial interest in getting sequencing into the clinic, much like we saw last year. Popular applications of next-gen sequencing, like RNA-seq and cancer profiling, will have their say. Interestingly, exome sequencing seems under-represented… one gets the feeling that this community, at least, is beginning to consider it routine (ho hum). I’m pleased to see the term “metagenomic” a few times, which suggests a growing appreciation of the importance of the human microbiome and similar topics. Eric Boerwinkle (Univ. of Texas) is giving a talk on ““Whole Genome and Exome Sequencing and Analysis of Large Numbers of Deeply-phenotyped Individuals Reveal the Genetic Architecture of Complex Traits: the CHARGE Consortium”. Matthew Wiggin of Boreal Genomics will present “Multiplexed Detection of Low Abundance, Tumor Related Nucleic Acids in the Plasma of Cancer Patients”. Malachi Griffith, of the Genome Institute at Washington University, has a talk on “Clinical Cancer Sequencing and Integrated Analysis of Whole Genomes, Exomes and Transcriptomes”. Mark DePristo of the Broad Institute (a lead contributor to GATK) will discuss “Overcoming Today’s Limitations in Sequencing Technology for Human Medical Genetics” and hopefully commercial attendees won’t have to pay $300K to listen. The Twitter hashtag is usually cluttered with commercial stuff, so you might want to pick some prolific Twitter-aholics like Nick Loman and Aaron Quinlan. My friends at @nextgenseq made a Wordle tag cloud that nicely illustrates the theme of this year’s AGBT meeting. 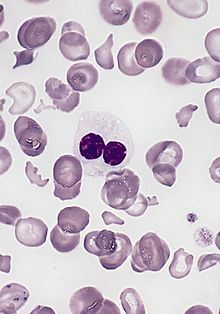 Myelodysplastic syndrome (MDS, also called preleukemia) is a blood disorder characterized by ineffective production of myeloid cells, or leukocytes. The disorderly and ineffective production of blood cells from stem cells in the bone marrow results in low blood counts, or cytopenias. As many of 30% of MDS cases progress to full-blown, chemotherapy-resistant secondary AML. This week in Nature Genetics, two studies report recurrent mutations in splicing-related genes in blood tumors. First, Tim Graubert and colleagues describe the whole-genome sequencing of an MDS-derived secondary AML tumor and a matched normal (skin) sample. They detected and validated 507 somatic single-nucleotide variants in the tumor, nearly all of which (505) were detected in the MDS sample. Among these were 30 coding SNVs, of which one was a missense mutation in the U2AF1 gene. The same codon of U2AF1 was also mutated in two other MDS cases evaluated by WGS, highlighting it as a potential recurrently mutated gene. The authors undertook systematic sequencing of U2AF1 exons in 150 MDS cases, and found that 8.7% had mutations at Ser34. Mutant allele frequencies were at 40-50%, suggesting that the mutation was present in most or all tumor cells. • SNP arrays and WGS indicated no large deletions or uniparental disomy spanning the U2AF1 locus. • Deep cDNA sequencing demonstrated that both wild-type and mutant alleles were expressed. • There were no apparent differences in the amount of U2AF1 mRNA between wild-type and mutated samples. • In the 150 cases examined, no other positions in the gene were mutated (other than residue 34). Taken together, these observations suggest that U2AF1 alteration was an early, initiating event and likely represents a gain-of-function mutation. U2AF1 encodes a small regulatory subunit of the U2AF splicing factor. It binds the 3′ AG splice acceptor dinucleotide of the pre-mRNA target intron, and forms a heterodimer with U2AF2, which binds the adjacent polypyrimidine tract. U2AF1 is highly conserved, and loss of both copies is lethal in many species. Although it’s not known which domain of U2AF1 binds the mRNA, the Ser34 mutation occurs in a zinc-finger motif that may have RNA binding activity. Interestingly, in vitro reporter assays revealed that the Ser34 mutation causes an increase in splicing activity and more exon skipping relative to wild-type U2AF1. Further, an analysis of differentially expressed genes (by microarray) between samples with or without U2AF1 mutations revealed that three of the top functional categories for down-regulated genes were splicing- or RNA-recognition-motif-related genes. This observation may reflect one or more compensatory mutations for the increased splicing activity of U2AF1 mutants. The authors focused on SF3B1 mutations, which was altered by somatic point mutations in ~10% of cases. Systematic screening of 279 cases by 3730 sequencing revealed that 9.7% of CLL tumors harbored SF3B1 mutations, making this the most frequently mutated gene in CLL identified to date. The protein encoded by SF3B1 is involved in the binding of the U2 snRNP to the branch point near 3′ splice sites. It interacts with RNA sequences and at least two proteins near the branch point: the early 3′-splice-site recognition factor U2AF65 and the branch point–binding protein SF3B14, as well as the RNA sequences near the branch point. RNA-seq of SF3B1-mutated cases revealed some patterns of aberrant splicing, most of which paired a known 5′ donor site with a new, abnormal 3′ acceptor site. An analysis of splicing target genes revealed truncated versions of SLC23A2, a vitamin C transporter, and TCIRG1, one of whose gene products is a T-cell immune regulator. Another altered gene was FOXP1, known to be dysregulated in diffuse large B-cell lymphoma; the altered transcript lacked two PEST sequences normally required for protein degradation. Most adult tumors harbor hundreds or thousands of somatic mutations, only a fraction of which are likely to drive development and growth. Recurrence of mutations in the same gene or pathway remains the best way to isolate these “driver” mutations from background passenger events. These two studies, and a handful of others published late this year, suggest an important role for aberrant splicing in the early development of myeloproliferative disorders, such as MDS/sAML and CLL. What’s particularly important is that these appear to be gain-of-function mutations, which opens the door to new potential targeted therapies. It’s one step closer to personalized medicine for cancer patients, brought to you by next-generation sequencing.